Prescription drugs like Lipitor have side effects and low cholesterol diets can be difficult to stick with. Apple Cider Vinegar, on the other hand, doesn’t have any negative side effects, and is easy to administer. Pectin is in both apples and apple cider vinegar and LDL (the bad cholesterol) attaches itself to the pectin, which is a fiber, and the cholesterol is eliminated. Apple Cider Vinegar can be used to lower cholesterol if it is the result of poor diet or genetic predisposition. Drink two tablespoons of Apple Cider Vinegar or make a tonic to drink as you would any other beverage. Two or three tablespoons of apple cider vinegar can be combined with a tablespoon of honey, mixed well, and topped off with spring water, sparkling water, lemonade, or any juice. In May 2005 the Japanese Society of Nutrition and Food Science determined that two-three tablespoons per day will maximize the cholesterol lowering benefits. Apple Cider Vinegar can be used in cooking as you would use any other vinegar. The taste is different but usually negligible as a substitute for white vinegar. You can make salad dressings, marinades, and sauces. Apple cider vinegar is excellent as a meat tenderizer, to increase fluffiness of cooked rice, and to prevent pasta from sticking. Apple cider vinegar can also be used as a salt substitute when steaming fish or vegetables. You can, of course, use apple cider vinegar for pickling, once of the most common uses for any vinegar. If you simply do not like the taste of apple cider vinegar you can take it as a supplement and still reap the benefits. 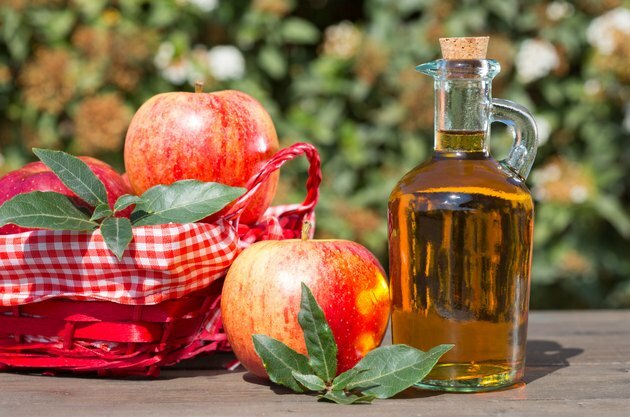 The greatest benefits will be in the liquid form that has not been pasteurized, and if you are going to take apple cider vinegar in tablet form be sure to buy one from a reputable manufacturer to ensure to efficacy and integrity of the acetic acid and pectin which are the cholesterol lowering compounds.